Spotted an emergency? Dial 999! Police cars, ambulances, lifeboats and fire engines rush in to perform daring rescues! 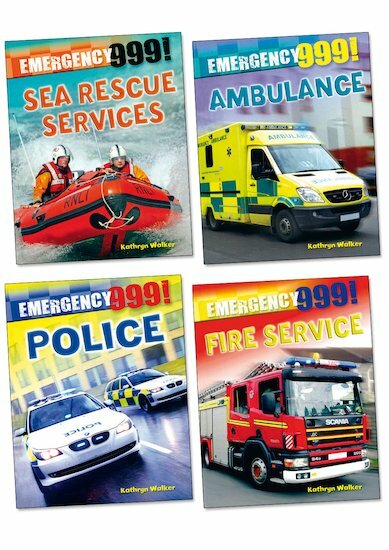 Satisfy thrill-seeking youngsters with these dramatic guides to the emergency services. Taking readers behind the scenes in exciting photographic chapters, they detail every aspect of what’s involved when people tackle an emergency. Find out how 999 calls are received by specially-trained personnel, and how tracking technology helps to locate the scene. Learn about the life-saving equipment and hi-tech vehicles that police officers, rescuers and paramedics use, and find out about some of the jobs that they might be called to – from examining a crime scene to rescuing stranded whales or dealing with an unexploded bomb! Perfect for fact-hungry readers, these titles are stuffed with information and interesting tidbits, giving a thorough insight into the subject matter. Face-to-face panels look at the daily experiences of staff, while tips on how to respond to an emergency teach valuable life-saving skills.